This 20th annual Southern Appalachian Undergraduate Philosophy Conference takes place Feb. 8-9 in Karpen Hall, Laurel Forum, and is free and open to everyone. 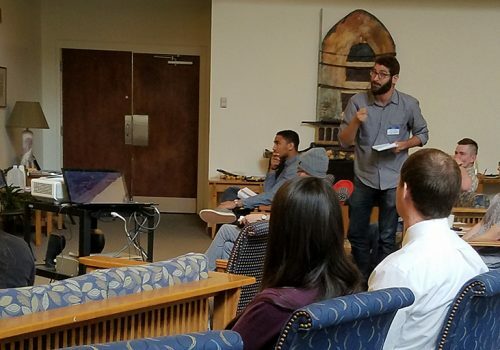 The conference provides a professional-style philosophical forum for aspiring undergraduates to present significant and original work, with prizes awarded to three winning presentations. The conference begins at 4 p.m. on Friday afternoon and closes with a 5 p.m. reception on Saturday. Judges and keynote speakers for this year are Professors Vridna Dalmiya of the University of Hawaii, and Chris Cuomo of the University of Georgia, and our own faculty members Melissa Burchard and Keya Maitra will serve as moderators. The conference schedule is online here. Support for the conference is provided by the Deryl Howard Memorial Fund; the Thomas Howerton Professor of Humanities; the UNCA Philosophy Club; the UNC Asheville Philosophy Department.